Bob Marley, who is easily one of reggae’s most successful and influential musicians, has left behind a legacy that still inspires artists today. With countless critically acclaimed albums and several prestigious awards, he continues to have an impact on our lives. Now we’ll be able to listen to the Jamaican's last recorded performance on an upcoming live album due out early next year. 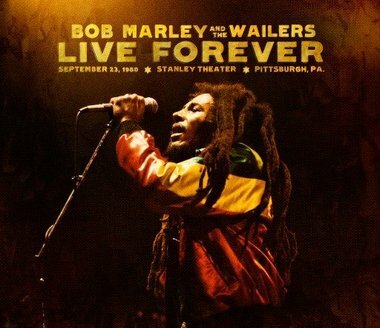 This will be the sixth official live album by Bob Marley and The Wailers, and is entitled Live Forever. The album has two CD’s worth of material, and features some of Bob Marley’s greatest hits like “Jamming”, “Redemption Song”, and “No Woman, No Cry”. The material was recorded 30 years ago at a show on September 23rd, 1980 in Pittsburgh, Pennsylvania just after writing the hit album Uprising, which would turn out to be the last studio album Bob Marley released during his life. The record is planned to be available for purchase on the first of February.